As the name sounds, a small group tour is intended for a small number of people to visit and tour a venue. There are small group tours for every interest, hobby or destination. You can join a food, art, education, extreme sport, walking or cycling tour – in any country or place imaginable. 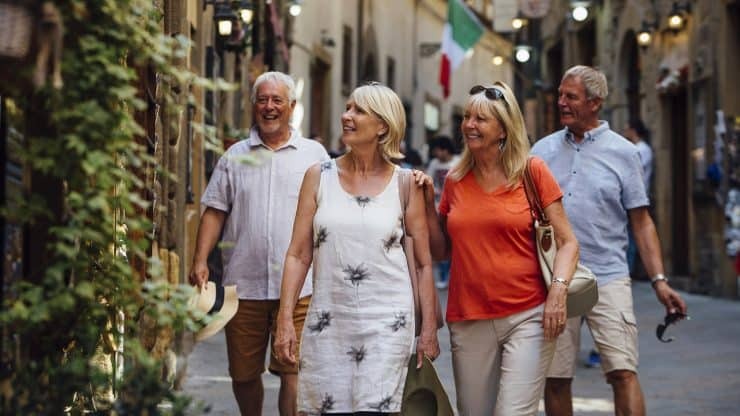 What’s in store if you’re going on a small group tour? The first principle is that you join a small group for a specified period of time in a specific place. You are united by your common interest with a small group of like-minded people. The tours encourage camaraderie and provide a safe travelling experience. And think of all the new friends you’d make! I first experienced small group tours when I interviewed Josie about her ‘en plein air’ small group tour. Josie travelled to the heart of Australia with a small group of people, all interested in the same thing: an opportunity to paint in remote, not easily accessible, pristine environments. Small group tours make sense in foreign locations. A local guide helps with the downside of travel by arranging transport, knowing where to eat and guiding you to the most interesting sights. By joining a small group tour, you access places not easily available to independent travelers. A small group tour can be a tour within a holiday. It doesn’t necessarily have to be the whole holiday. One of the best small group tours I’ve ever done was a ‘Back of Bike’ food tour of Ho Chi Minh City. My husband and I spent five exhilarating hours whizzing on scooters (we rode pillion) through the back streets of the city. We were taken to amazing and different restaurants that we would never, ever have been able to access without local experts. The one aspect common to most small group tours is, you have to travel with a small bag (unless you’re going skiing or visiting the Antarctic, but those are special cases). Bus tours can be prescriptive. In Queensland, Australia, certain bus tours limit your luggage to one small bag only, without wheels and when filled, to weigh no more than 12 kilograms. For Planepack, that’s quite generous: I normally travel with 7 kilograms only. If you want to travel in a small group tour, Planepack’s packing guides, tips and advice will help you plan and pack your small bag. If you’re interested in exploring small group travel further, have a look at Adventures with Sarah for even more packing advice. You’ve decided to go on a small group tour, but you’re unsure how to fit your things into a small bag? Help is at hand: I’ve written a ‘How to plan and pack for a small group tour’ guide. You can download it for free and enjoy the Planepack tips, case study and advice. So, happy small group tour! I hope you consider a small group tour for your next holiday. Do you think you would enjoy a small group tour? Which destination would you like to tour with a small group? Have you been on such a tour? Please share your experience and stories in the comments below!